Sculptor John McIntire is donating his collection of aloha shirts to the Memphis College of Art in Memphis, Tenn., to be displayed for a sale to benefit a scholarship in his name. MEMPHIS, Tenn. » Anyone can donate money to their favorite college. 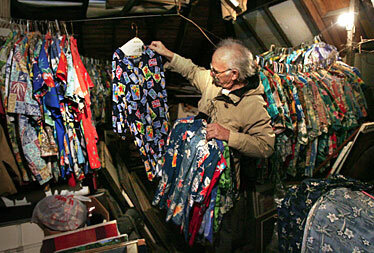 John McIntire turned over something of greater personal value: his collection of 700 aloha shirts. McIntire, a sculptor, gave the shirts to the Memphis College of Art, where he once worked. He had collected the colorful garments through 50 years, picking them up at yard sales and junk stores, never paying more than $5 apiece. McIntire, 72, wears aloha shirts most days, putting a T-shirt underneath when it's cold and adding a coat when necessary. "The shirts are just like him," said Don Dumont, who brought his truck and a student from the college to pick up the shirts. "Hawaiian shirts are fun, relaxing, easygoing, nonthreatening. That's John." The college plans to display the shirts for a sale to benefit a scholarship in McIntire's name. He decided to give the collection away -- keeping only four of them -- to make room for a studio in his attic. He won't miss them, he said. "I'll just go out to yard sales and start collecting them again," he said.